The appartment was very nice ... good kitchen which was well equipped. Main bedroom was fine, 2nd bedroom a bit small. Living room light and spacious. Bathroom was very small and climbing into the bath to have a shower would be difficult for disabled or elderly people. Be aware also flat is on second floor with no lift. 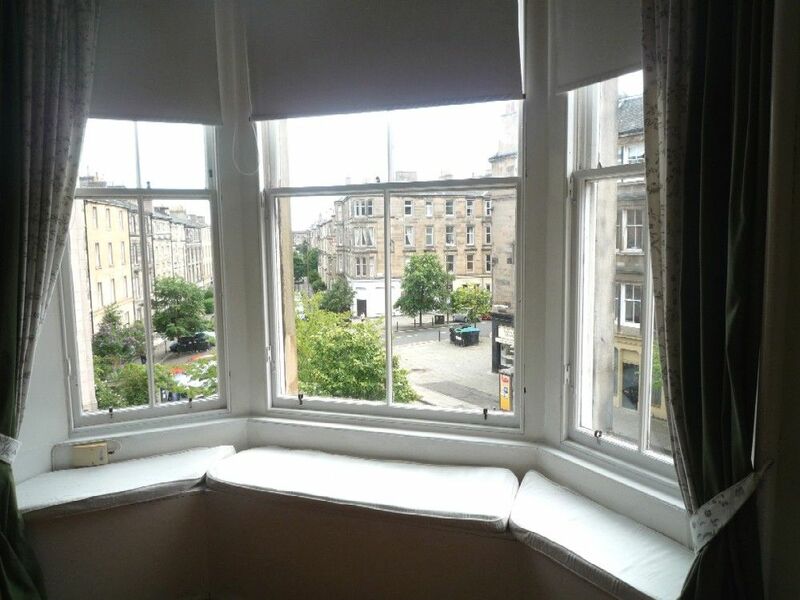 Flat is about 20 mins walk to Princess Street - very convenient, with plenty of cafes, restaurants and supermarkets nearby. Glad you enjoyed the apartment and the location. The main bedroom has a standard-size double bed, and the single bedroom is a small boxroom that's off the hallway; the layout of these Victorian apartments restricts the size of the bedrooms and also the bathroom, which, as you point out, is not suitable for those with reduced mobility. Most older apartments in Edinburgh do not have a lift/elevator because of the age of the building. Good to know that you enjoyed the nearby cafes, restaurants and supermarkets. Really enjoyed our stay. Cool place with a fantastic view out onto New Town. A quiet part of the city but still walking distance from The Mile. Great cafe at ground floor for breakfast/coffee. Apartment is a bit rough round the edges but some lovely welcoming touches. Appreciated that the host messaged during our stay to check we were comfortable. Suited our family really well - thanks Martin we had a lovely time! Gracias por haberte molestado en escribir un comentario, lo agredacemos. Agradecemos que os haya gustado el apartamento. Como dices, una sofá cama no suele ser tán cómoda como una cama normal, así que si hay más de dos adultos por más de unas pocas noches, avisamos escoger un apartamento con más de una habitación. No obstante, la sofá cama sirve por unos dias, o para niños, y da una opción más economica que un apartamento más grande.